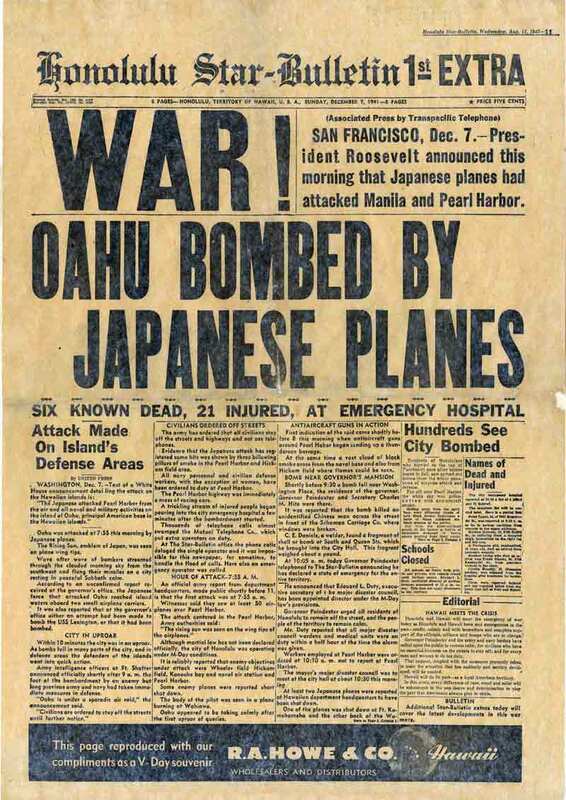 At 7:55 a.m. on Dec. 7, 1941, six aircraft carriers and 360 aircraft of the Japanese 1st Air Fleet led by Vice Adm. Chuichi Nagumo launched air strikes on U.S. installations in the Territory of Hawaii. The main target was the U.S. fleet at Pearl Harbor. Taylor telephoned the grass airstrip at Haleiwa, 10 miles from Honolulu, where the 47th Pursuit Squadron had been sent for target practice. 2nd Lieutenants George Welch and Kenneth Taylor – both new fighter pilots – were at Wheeler Field when the attack started. They ran outdoors and saw smoke rising over Pearl Harbor. Taylor telephoned the grass airstrip at Haleiwa, 10 miles from Honolulu, where the 47th Pursuit Squadron had been sent for target practice. He told ground crews to fuel and arm two P-40B Tomahawks. The two pilots were strafed while they drove at high speed to Haleiwa. They took off in two P-40Bs only partly loaded with machine gun rounds. Attacking a formation of Nakajima B5N2 “Kate” torpedo and level bombers, Welch and Taylor each shot one down. Moments later, Welch’s P-40B was hit with rounds from a Japanese tail gunner. Still, he and Taylor shot down another Kate apiece. Welch and Taylor landed at Wheeler to refuel, re-arm, and take off again. Welch ultimately flew three sorties and was credited with shooting down four Japanese aircraft, including a Mitsubishi A6M2 Zero fighter. When he first awoke, Taylor could find only his tuxedo trousers from an officers’ club dinner the previous night. He took off wearing them. But 2nd Lt. Philip M. Rasmussen, also at Wheeler Field, outdid Taylor for sartorial elegance. Rasmussen was wearing purple pajamas when he awoke to hear the attack beginning. Rasmussen, 1st Lt. Lewis M. Sanders, and two other P-36 pilots tore into a Japanese formation. Sanders got behind one of the raiders and shot it down. 2nd Lt. Gordon H. Sterling, Jr. also shot down a Japanese aircraft, but then was shot down over water and drowned after getting out of his aircraft. Just before witnessing Sterling’s death, Rasmussen charged his guns only to have the machine guns start firing on their own. 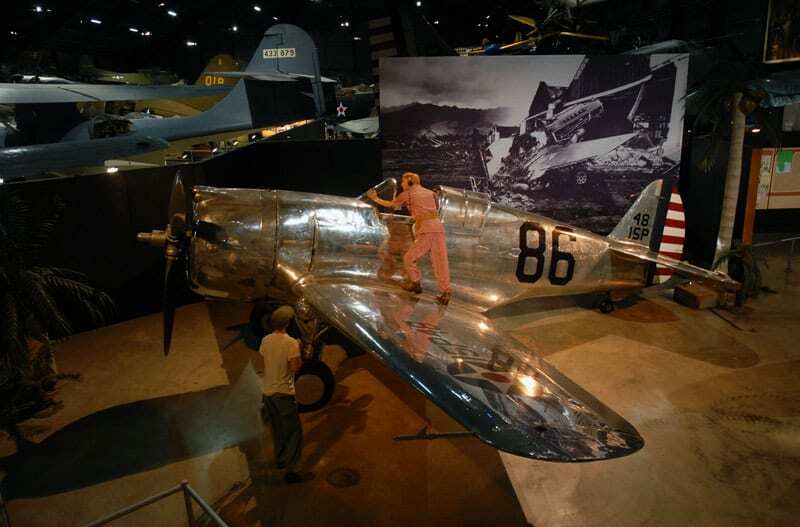 While the pajama-clad pilot struggled to stop his guns from firing, a Japanese aircraft passed directly in front of him, flew into his bursts of gunfire, and exploded. Shaking off two Zeros on his tail, Rasmussen got his guns under control, raked another Japanese aircraft with gunfire, then felt himself taking hits from a Japanese fighter. “There was a lot of noise. He shot my canopy off,” Rasmussen said. Rasmussen lost control of the P-36 as it tumbled into clouds, its hydraulic lines severed, the tail wheel shot off. Rasmussen did not know it yet, but two cannon shells had buried themselves in a radio behind his pilot’s seat. The bulky radio had saved his life. He landed his badly damaged aircraft without the use of brakes, rudder, or tail wheel. Rasmussen was one of 14 Air Corps pilots who attempted to engage the Japanese at Pearl Harbor. The Pearl Harbor attack killed 2,403 people, most of them American servicemen, and wounded 1,104. Four of the pilots lost their lives but were credited with shooting down 10 of the 29 Japanese warplanes lost to all causes that day. The Pearl Harbor attack killed 2,403 people, most of them American servicemen, and wounded 1,104. Four of the pilots lost their lives but were credited with shooting down 10 of the 29 Japanese warplanes lost to all causes that day. Great history piece. It is amazing how far technology has increased to today’s standards. Seriously, I love inspirational stories like this one that show the dedication, and honor displayed by the men and women who defend our country. As a veteran it gives me a great sense of pride in our service men and women..from the past, the present and those who will step up to fight for freedom in the future. @Gale – I too am a veteran and the amount of honor and pride I have for my country and those who serve is almost impossible to explain.